I’m a great lover of a good tatin and I’ve made this version a couple of times now since I discovered how well pear and salted caramel go together. It certainly went down a storm at the last two supper clubs and so, just to make sure it really was as good as I thought it was the first and second time round, I will be making it again at the Conwy Feast later this month while our British pears are in abundance. I reckon I make mean savoury and sweet versions of the tatin and I’m always slightly amazed and quite impressed when I turn them out of the tin looking decorative, with their eye-catching swirl of fruit still in the same place that I set it! I think a tatin looks much more spectacular than a Quiche or tart especially when their hidden fruity secrets are dramatically upturned and revealed. The gorgeous caramelised glistening top, with the soft fruit neatly laid out on the light crisp base is simple, but stunning. But I think a lot of people are a little scared of making tatin’s because they think they are tricky to pull off; it’s the whole idea that you have to turn something over quickly without dropping it that sounds terrifying in a lot of recipe books. They tell you to have ‘courage’ but I think that’s a bit over dramatic. Actually a tatin is deceptively simple to make; all you really need is a good pan that can go on the hob and then in the oven and a sheet of ready-made all butter puff pastry. As aI was making this for a supper club dessert I didn’t cheat. I took a leaf out of Nigella’s book and made mine with a Danish pastry base. A little more effort, but oh so worth it. The light, spongy buttery base seems to soak up the juices beautifully. It’s not as crisp as one made with puff pastry, but it holds its form and the fruit on top perfectly. Using pears instead of apples needed a little tweaking. 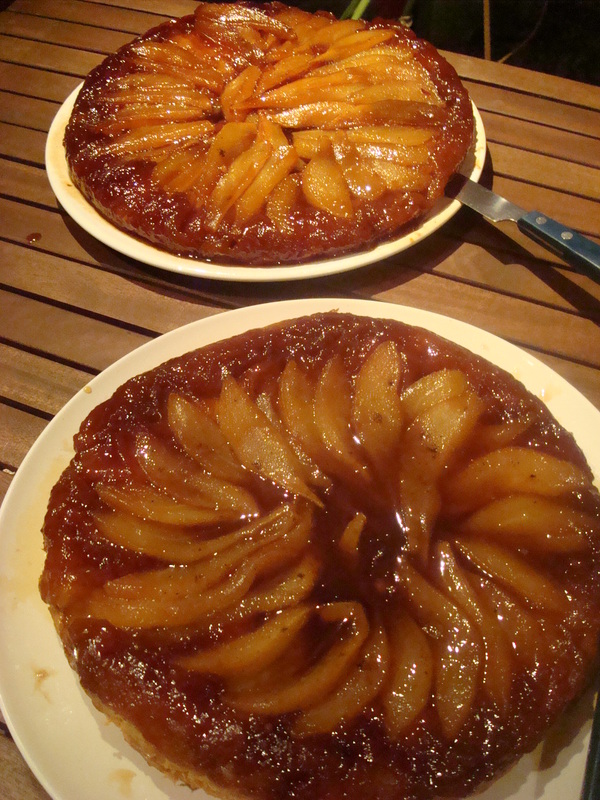 The first tatin looked beautiful and contained more pear, but for the second I cut thinner slices. One word of advice from a diner was to make the pear slices chunky as the thin slices were lost in the vanilla salted caramel. Point duly noted. Salted caramel has really grown in popularity over the last couple of years and what was once a well-kept cheffy secret, is now on the menu all over the place, from Haagen Daz ice cream, to Starbucks salt caramel hot chocolate. 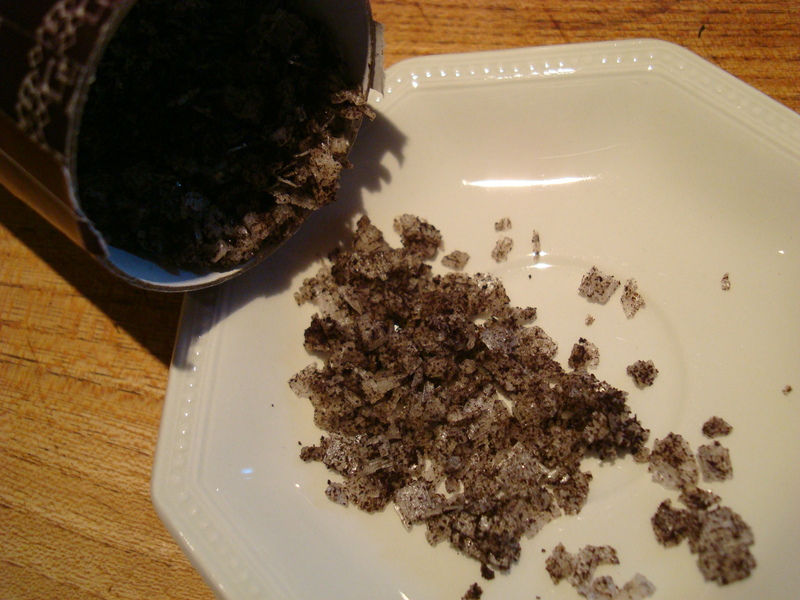 I was dubious for a while and not really sure I would like it…in much the same way as I didn’t quite trust the weirdly exotic salts I’d seen on the shelves of posh deli’s and over at Halen Mon, my regular local salt supplier. I felt slightly intimidated by them, as though I should really know what to do with them, but didn’t, so I shunned them. That is until I tried salted caramel ice cream. That was it; unsure no longer I went from smitten to obsessed in a matter of weeks. 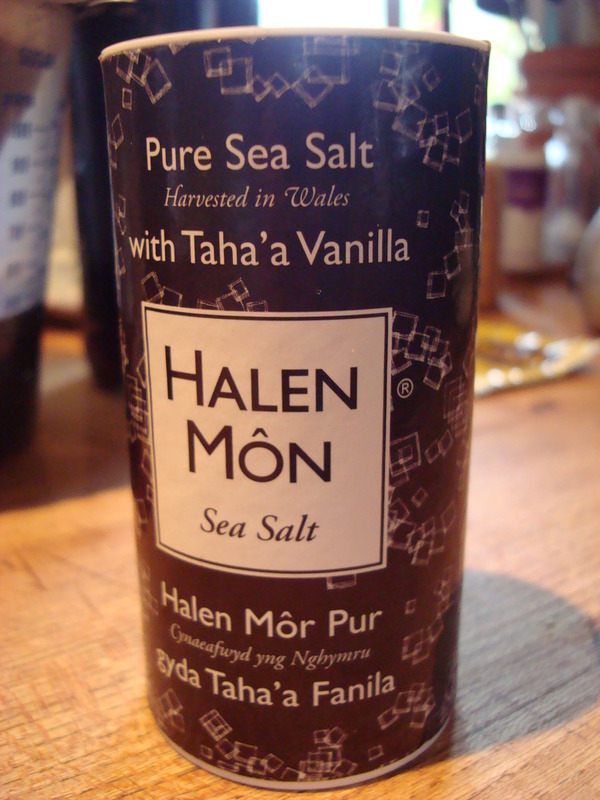 I’d always half fancied trying the vanilla salt I’d seen at Halen Mon, but wasn’t sure how or where to use it. The scent had absolutely intoxicated me, so as my salted caramel obsession grew I finally knew what I would do with it. And that was how my pear and vanilla salted caramel experiment began, although I don’t think that is where it will end. I still think I’m being a little cautious with the salt. I haven’t quite found the freedom to be really brave yet, but I’m sure I will get there soon and there are plenty of other combinations I can come up with…. hmm hold on, I’m thinking chocolate…smoked salt…caramel…you see an idea is forming already. Mix the water, milk and egg in a jug. Make this the day before you want to make your tatin. Add the flour, salt, sugar and yeast to the bowl of a food processor (this really is the quickest and easiest way to do it) and whizz round briefly to mix. Add the butter and pulse. You want to still be able to see big chunks of butter (about 1 cm big). Turn the mixture into a large bowl and with your hands or a plastic spatula add the milk and egg mixture. Dont over do it. You will be left with quite a gooey mixture with chucks of butter visible. Cover with cling film and put in the fridge over night. The next day take it out of the fridge and allow to warm at room temperature for a while. The lightly flour a large surface and roll out into a large square (about 50 x 50cm). Fold into three like a business letter and rotate the closed fold until it is on your left…like the spine of a book. Roll out again and repeat the same process two more times. You may not need all of this dough depending on how big or how many tatins you are making, but the dough will keep for up to four days in the fridge or you can freeze it for another day. Preheat the oven to gas mark 6 / 200 degrees C.
In your tatin pan melt 100g unsalted butter and 150g sugar. I’ve used both caster and granulated sugar and I’m not sure which one works best. Perhaps granulated gets a better caramel. You can try experimenting and see what you think. Cook, stirring occasionally, until it turns a beautiful bronzy caramel colour then remove from the heat and put to the side to cool. There was a little extra butter floating on mine so I gently poured this off. Having never used the vanilla salt before I read a few online recipes and decided the simplest way was just to sprinkle a bit over the top of the caramel before I added the pears. I didn’t want to over do it so I erred on the side of caution and probably only used about a quarter of a teaspoon. I could have added more and will do next time. Take as many pears as you need to cover the base of your tatin dish. I used about 5 for my large one, but really needed to use 6. They need to be fairly thickly sliced and packed tightly to form a circular wheel around the dish.. My pears were quite small so I did made an inner and outer circle. Finally lay your sheet of rolled out pastry over the top of the dish cutting to shape and tucking in well around the edges to enclose the fruit. You can save the off cuts for something else (Danish pastries?). Bake in the oven for about 20 to 30 minutes or until the pastry is golden and crisp and there are beautiful bubbles of caramel syrup visible around the sides. Remove from the oven and leave to cool for about five or ten minutes, then wearing oven gloves place a large plate over the top of the pan and swiftly invert. You shouldn’t have any problems with sticking and the tatin should just drop on to the plate with ease. Remove the pan and admire with awe. (If by any chance any of the fruit has stayed stuck to the bottom of the pan just pick it off and lay back in its place on the tatin. This is not a precious or pretentious desert and it doesn’t mind being adjusted and stuck back together a bit). Whip a carton of organic double cream with a tablespoon of icing sugar until quite thick and stiff. 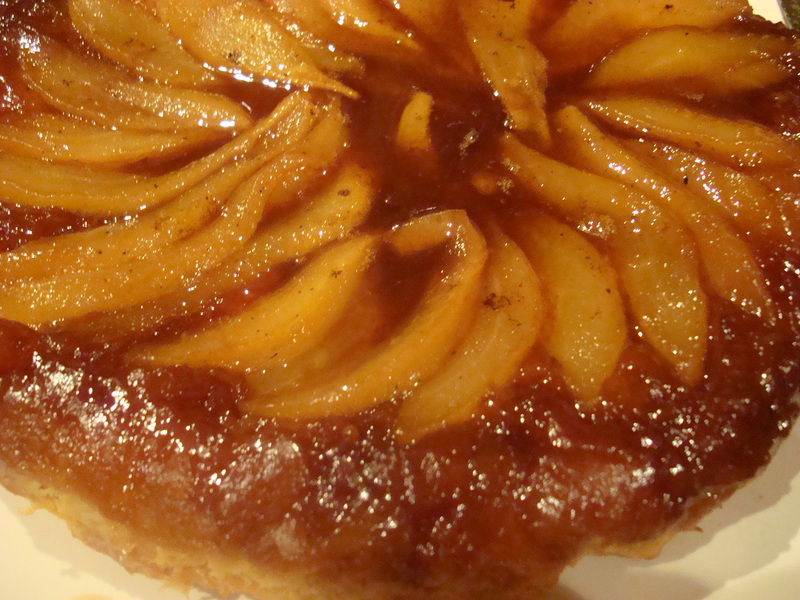 Stir in a tablespoon (or two) of Calvados brandy and serve a bit dollop with the tatin. don’t usually like pears – but the pear tart tatin with salted caramel was out of this world – could have eaten it all nite!! !